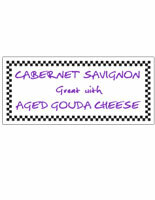 4-7/8" x 3-3/4" cheese tag has rotating numbers for easy price updating. Rewritable sign comes blank for displaying product names or recipe titles. Increment wheel can be used for LB, 1/2LB and 1/4LB pricing. Black checker pattern on white sign is a neutral coloring for most environments. 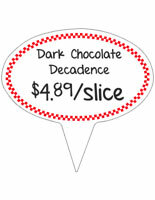 This cheese tag with rotating numbers is a modern version of the classic deli case sign. 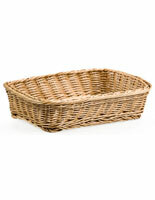 This updated unit is practical for all food items, for it is made from thin but durable plastic. The face of the cheese tag has a re-writable surface and four number wheels with one measurement wheel. This wheel can display: prices up to 29.99, 2/FOR prices, and unit increments of LB, 1/2LB, 1/4LB and EA. (each). The cheese tag that has a black check design is made to fit into any display and can be used across many different platforms. Signage like this can also be used to sell unique foods or special recipe prepared dishes for it does not rely on premade name cards. A cheese tag with a re-writable surface also has its advantages when showcasing items from specific farms. The price display offered here is North American made from thin plastic material, which ensures a low price point thus enabling all food pricing to be uniformed. 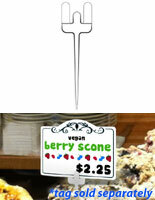 A deli sign, cheese tag that displays by the LB is optimal for products with ever changing prices. This unit is designed to be mounted with any number of different clips (sold separately). 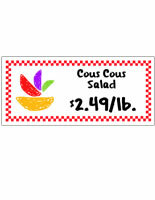 This cheese tag, called a deli sign, can be used with any type of product sold by the LB. 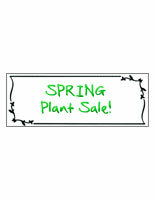 This sign is also great for meat, seafood, homemade recipe prepared food, floral shops and restaurants selling single items such as pizza by the slice. 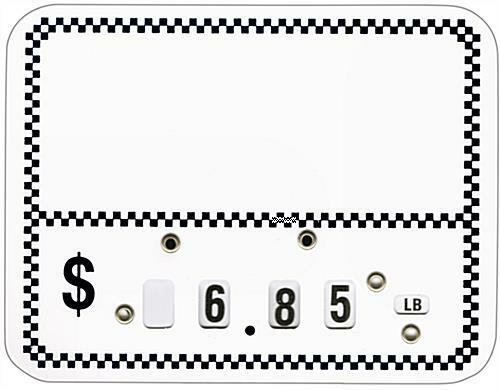 The cheese tag that has price wheels is designed to be written on with liquid chalk, wet-erase or permanent markers. The unit is able to be cleaned with common cleaners. This cheese tag is great for fast price and item changes. Please Note: Permanent marker will not erase off the surface of these signs. However, writing in wet and dry-erase markers will wipe off the signage surface. 4.9" x 3.8" x 0.03"